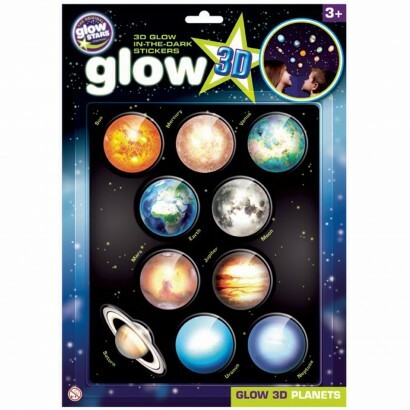 Reveal a glowing solar system in your room night after night with this pack of 3D glow in the dark planets. A pack of 10 planets, our solar system is depicted in 6cm diameter 3D stickers that look fantastic either on their own or teamed with glow stars. Allow to charge in the light, and these colourful planets will glow time and again for a bedtime that's out of this world! Reveal a glowing solar system night after night!